A native of Miami, Florida, Kenneth N. Robertson received a Bachelor of Science in civil engineering in 1958, and a Masters of Business Administration in 1960, both from the University of Kentucky. While attending UK, he played three years of varsity football ( 55, 56, 57) under Coach Blanton Collier, and was elected co-captain his senior year. He was also elected to Tau Beta Pi, Omicron Delta Kappa, and Lamp & Cross. Mr. Robertson joined Exxon Corporation in 1960 as an engineer at the company’s refinery in Baton Rouge, Louisiana, and during the next eight years held various engineering and supervisory assignments at that location. In 1968, he transferred to Exxon Chemicals, Inc., Baton Rouge, as head of its Project Development Department. He was named manager of the plant’s Chemical Raw Materials Division two years later. Mr. Robertson moved to the chemical company’s headquarters in Houston in 1974 as Manager of Olefins. 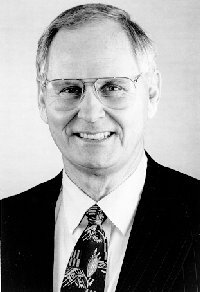 He was named vice president of Aromatics in 1976 and vice president of Olefins in 1977. In 1981 he moved to Hong Kong as executive vice president for Exxon Chemical’s Asian affiliate, returning to Houston in January 1985 as executive vice president for Exxon Chemical Americas. Mr. Robertson was named vice president, Basic Chemicals Americas, when the company reorganized in 1986, continuing in that assignment until his appointment as president of Exxon Chemical Americas in 1990. Mr. Robertson was named a senior vice president of Exxon Chemical Company in March, 1994. In this position he has worldwide responsibility for Basic Chemicals and Intermediates business units and a combined technology organization. Mr. Robertson was a member and an elder of the Memorial Presbyterian Church for 22 years. His involvement in other professional and civic activities included the University of Kentucky College of Engineering Dean’s Advisory Council; Board of Directors and Chairman, Houston Region of the National Conference of Christians and Jews; Board of Directors and Chairman of American Health Council; and the Rotary/Lombardi Awards Advisory Committee. Mr. Robertson died July 19, 2017 and is survived by the former Carol Lee Anderson and their two children.